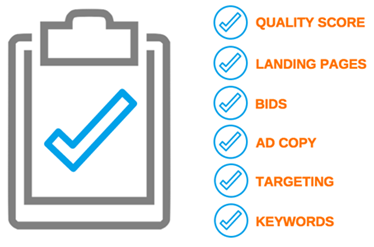 Paid Search is a complex combination of many elements including quality score, landing pages, bids, ad copy, targeting, and countless numbers of keywords. In order to ensure that your campaigns are running at peak performance you should regularly perform an audit of these aspects of your account, as well as a few others. By conducting a thorough audit you will gain a deeper understanding of your performance, pinpoint any current issues, and identify growth opportunities. Structure / Segmentation: how you structure your account is a major factor in both efficient allocation of budget and accurate optimization. Location Targeting: are you seeing clicks from location you don’t want to target? Location targeting is an easy fix, but also easily lost in the shuffle. Ad Scheduling: the average position of ads, as well as cost per click, vary by day of the week. Set your bid adjustments to increase and decrease during these times to fully capture impressions and clicks during the most competitive times. Remarketing: don’t just target anyone who has ever visited your site…look at what products and services they are interested in and build segmented lists. This will create a better experience for your visitors and ultimately maximize conversions. Keyword Match Types: Broad match, exact match, and phrase match types are all important to a successful keyword strategy. Ad Extensions: part of the quality score formula, ad extensions are critical to your PPC success, or failure. Take advantage of sitelinks, callout, location, social, and review extensions. Ad Position: this can have an enormous affect on your click-through rate so ensure that your ad position is optimized properly. Ad Copy Testing: vital to the health of your account, constantly testing with various copy and calls to action will help improve the performance of each ad group. Landing Pages: if your landing page content doesn’t sync up with your ad then you could be increasing your bounce rates and significantly decreasing your conversions. Search Query Performance Reports: the goal of PPC is to limit bad leads while scaling quality leads. The Search Term Report is helpful in identifying themes of keywords that should either be negated or included in your campaigns, ensuring that your keywords are relevant. Device: mobile is an important component that should be included in your optimization efforts. Mobile media usage has surpassed desktop usage, and the number of mobile searches are increasing every year. Display: an effective channel to increase reach and awareness through multiple targeting opportunities. Video: also provides you with multiple targeting opportunities and includes placement on YouTube and Google Display Network (GDN). 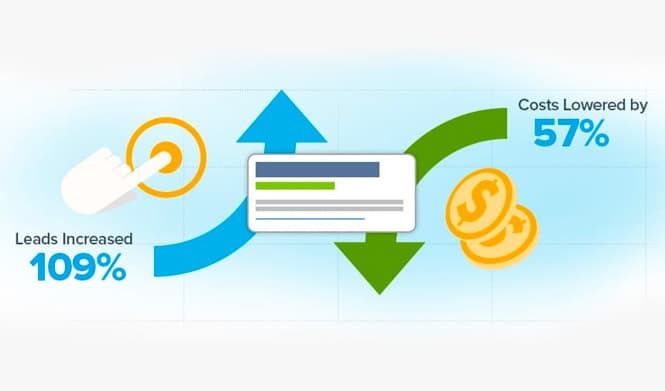 Following our analysis, we evaluate the findings and provide you with a detailed optimization guide, outlining recommendations that will increase the success of your PPC campaigns. Following an audit we recommend an ongoing partnership to continue management of your PPC campaigns. By following our paid search process, we improve your results by taking advantage of the opportunities identified in the audit, restructuring your account, identifying and testing new opportunities, continually reviewing your results, and creating cross-departmental collaboration. We take care of all aspects of your PPC campaigns to ensure you’re beating the competition. If you have questions or are ready to discuss how a Paid Search Audit can help you EVOLVE your organization, talk to a Blast Solutions Consultant today.